and don't forget to use PIN13 as RX and PIN14 as TX. Or change it in the code directly. As a workaround it is a static setting. This type is defined in the ESPEasy.ino. I changed the code a bit, again. Unfortunately I can still not put it in the ESPEasyPluginPlayGround. For some reason I cannot upload any more pics, zo, there is a link below. The changes are that it better communicates with the Nextion. I adapted the Hollyberry HMI file. With this you get a thermostat that can up and down settings of t3, between 0 and 30. After update it sends a message to the ESP. Bt0 now is a toggle switch with which I switch a lamp. Just for testing. B1 only sends the Component ID, but you cannot distinguish on or off. Next I have made a textbox component in Domoticz, with idx 310. It gets all the messages from the ESPEasy via the HTML interface. Nice to have as a log device. Sorry, can’t test it with mqtt or others. The code is far far away from perfect, but per haps it persuades to make better code and more functionality. Can get it to work, I connected a 3.2" advanced Nextion screen (TX to D7/GPIO13 and RX to D5/GPIO14) via a 3v3-5V level shifter. I installed ESP easy R120 with the plugin 117, compiling and uploading is ok. I am using a NodeMCU v1. 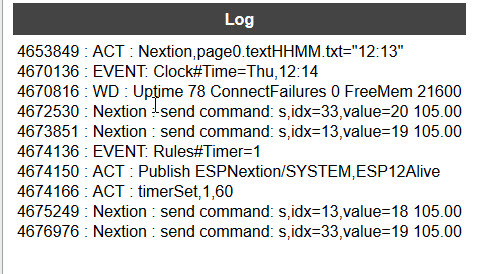 In the ESP easy web interface I created a Sexton device with 1st GPIO 13 and 2nd GPIO 14. In the line 1: field I added: page0.t0.txt="test"
I created a tft file for my Nextion containing a t0,t1,n0, b0 and b1 field. But when I connect everything and boot, nothing shows up on the Nextion display. I sniffed the RX and TX line going to the Nextion, but no data what so ever shows up. Any idea what I might do wrong here? Already tried another NodeMCU and other set of GPIO's, but nothing. Hi. I never tested IT with a advanced version, so that can be a Challenge. If you don't get any data on rx or tx, you can try to make the tx and rx fixed. I showed how to do that some posts back. BertB wrote: For only sending data from the Wemos to the Nextion, Rx on the Wemos (Blue wire) is not required. This is how I connect my nextion. You can choose to feed it from a strong (Nextion requires sufficient power) usb or an external 5 volt DC power supply. I tested it with a 1n4448 and a 1n4004 diode. It can be necessary to add capacitors. Are you sure, that levelshifter is necessary? As I understood, is Nextion a 3.3 V device (it has own 3.3V voltage regulator on board -- U1 6209A). You might be right. I will check tonight. You are so right. I measured the signal with my oscilloscope and it never came above 3.3 volt. So, I got rid of the diode. Thank you for the tip. After hours of testing,I managed to get weather wunderground and wind, switch and alarm commands with domoticz state feedback and local temperature and domoticz temperature. Thank you for the nextion plugin !!! And may be broken, but still going strong. for its new arrivals with capacitive multi-touch panel and a good looking shell. It’s more convenient and easier to design Pro HMI for embedded system. I tried the code of thermostat to @BertB but the code send on serial is bad. See my log, an idea ? Just want to add that I just got my 2.4" Nextion display the other day and I follow this thread with great interest! I found this blog which is very informative about the Nextion/ESP symbiosis. It works but i don't know really why ! I've taked an old *.bin and it's ok ! Is it possible to get the input from the display back into ESPEasy? Or is it only one way as of now? Looking good though! I want help you but i don't understand your question ! Well, if you press a (virtual) button on the display, will that give that information (that the button is pressed) back to the ESP? My question: is it possible to use the Nextion as input? Have you see my post page 10 with code = ID button ? Sorry, most have missed! Thanks! I'm new on this forum,so hello. I have nextion lcd and i trying send to them some data using lua script. I saw examples to this,but only using arduino software..i like to use only esp and lua. One thing is hard to do,mayby someone has solution. I have to send 3x 0xff data to end transmission. If i send hex in next line,to the end of print commant i got /r/n so this metod is not ok.
How to send some hex data inside the print command? Variable,table or using function inside? "t0="test"0xff 0xff 0xff (0xff='255' in asci,11111111 in binary). I'm new on this forum and i've discovered Nextion display on French domotic forum. I've a question about the plugin: is it possible to switch between page (page0, page1, ...) ? In a script, like after a button push. 770 is de code of the button that has been pushed. or through a json call. How do you for the battery, we can see a photo inside ! It basicly ru s on a single 18650 powerbank ript apart. Is it possible to do the same think with MQTT ? Use the same commands over MQTT. See wiki for more info. I am not sure the plugin also works with the enhanced models, but first you need to prepare the display, so that it contains text and number objects. There are many tutorials on the web that sohw how to do that. Especially the tutorials with Arduino are useful. Are you sure the baudrate is set ok? Did you for instance test it with a USB to serial converter and Nextion Editor to send it the text you want? Where is the baud rate set? In the plugin? How did you program the Display with USB to serial? Or is it another way? Is there any simple code in the Arduino IDE to display the text on the display? Connected only wemos D1 mini pro and nextion. This is how you celebrate your first success with this http://support.iteadstudio.com/support/ ... rl_locale= contributor to Dave A "Steve, thanks very much for your help. " etc .. So at least the display works (I thought it was necessary to break it). Perhaps the problem is that your library does not support Nextion Enhanced. Or ...? I am having issues to get sliders running, some how the data looses its first chars. Tried alsmost anything i could think of but did not find any answers. Rules just wont do for my setup as there are to many buttons and things going on that 4 pages arent enough for me. This firmware does reveals that the nextion sends out more data on the serial than we receive. I prefer node red and mqtt route, as you could change the status of a button based on incoming msg. So when the lights are set on thru a rocker, the status on the nextion screen will be updated. I would prefer to use the espeasy route, but some how i cant get it working further than buttons and updating fields. Very well posible. I never tested it and I do not know the difference between the two. On the other hand, the code shows some strange serial port handling. I am not sure what baudrate is used to communicate with the display, but the plugin uses 9600 baud. Please keep in mind this plugin is highly experimental. I did ask for someone with more programming skills to make it nice. Without using the Nextion drivers, it is not easy to interprete the data coming from the display. I created a kind of workaroud for sliders. It is a mixture of programming the display and the use of Rules. Regarding MQTT, I have a lot of problems getting it to work reliably. Its much appreciated, all the efforts you put into the plugin. I got the dimmer running thru the mentioned plugin, but Espeasy gives me more flexebility in other devices. Your programming, is much better than mine... with a lot of effort i can read some. I also did see on Jeffs website that there is some one that has things running up and down, not sure as time is a issue at the moment here. The example on jeff's website is domoticz related and works with bash scripts. What i want to try is that my toggle buttons get their status get updated thru mqtt. So the intention is to make a button visible based on the on or off status and later on also push dimmer values to a slider. and get buttons updated based on a device status. I am not sure how the decoding in your plugin works, but it could be that some data from the nextion comes thru as it sends more data than only a key press. ( strange data that occurs now and then ) The other firmware works on softserial to, and does not receive any weird chars. This will increase or decrease value of 1, is it possible to make it change (+ or -) of 0,5 ? The variable in Nextion is either a string or an integer. You could try to work it out, by adding or subtracting 5 and dividing the value by 10 in domoticz. First post here so want to thank all contributors, very good thread and just the plugin i needed. ESP12E bare connected to Nextion 4" and MQTT to Node-red. Had a hard time compiling ESPEasy v2.0.something but in the end did manage with the v2.0 with plugin included. Also took some time to understand the espeasy setup, needed to get MQTT publish triggered etc. %systemdate% etc not yet available in this version either so now filling this data via formatted MQTT input from node-red. All communications sorted now, there is just one thing not clear to me, are actually 2 things. First, in the ESPEasy => Device tab, the section with the 4 Values, i just don't get what "code" stands for and where the reported codes/values come from. i get a constant code value of 105.00 but when i use |u instead of |s the code changes all the time and part of the send string "|u,i33,n,s18" is missing. I suppose "|s |u" is some lua talk? at some point lua and other text came as data, but happened only once. The other Values are also filled when i send a button press with this code to ESP, but can't figure out where the come from. [update] Ok sorry, got it, about the 4 value fields anyway, it's the serial read buffers. Code is assuming the deviceid is being sent with the 0xFF's ending. Had to rack my brain for some 1970's info stored away very deep about serial comms.. I get that the plugin is a bit of a quick and dirty solution but it works so love that, and the print string is an ever quicker and dirtier solution then, but don't see how BertB's rules would work if no device id is being sent. Will give it some more thoughs and tries, maybe try Pete Scargils way of using "get attr" on the Nextion. [update2] Solved my problem by only using button/deviceid then rule on Nextion#code to send '1' or '-1' ,depending on button, via mqtt to node-red and have node-red return the desired temp. update is fast enough for ux ease-of-use. First of all: Great Plugin ! I am just beginning with the plugin for the Nextion display. I flased a nodeMCU V 1.0 and I have communication with the display. I can send Data to the display through a url (http://192.168.178.55/control?cmd=NEXTI ... txt="Hallo" ). print "|u,i230,n,s" The parameters where do they stand for? The "1230 thats the Idx value that's simple but the rest?" First of all, the code is not ready, it needs a some more attention, but I do not have much time to do it. output 1 = pagenumber * 256 + itemnumber. output 2 = button state, 0 is off, 1 is on. You only need to tick the Send Component ID box for that. In this case idx 7 must be a real switch. Nextion id and idx are not related. It can even get better if you only enable Send Component ID in the Touch Release Event of a button. Let's assume that gives the code of 774 in the ESPEasy and in Domoticz you have a switch with idx 7.
you can toggle the switch. With a switch b5 on page3 of the Nextion, obviously, you get a feedback. The switch is grey when off and green when on. It is important that the switches have a vscope set to global.